Altimeter Group conducted research, and gleaned input from 34 vendors, agencies, and experts, to determine success criteria and develop a roadmap for Facebook page best practices. We found Eight Success Criteria for Facebook page marketing, and then tested the maturity of 30 top brands across six industries. Our heuristic evaluation revealed that brands fell short – nearly half of the brands we reviewed (14 out of 30) did not fully leveraged social features to activate word of mouth, the hallmark behavior of social networks. Within this immature landscape, a few brands were on the right track to successfully harnessing Facebook page marketing. Brands like Pampers, Macy’s, Kohl’s, and AXE increased engagement and activated word of mouth through advocacy and peer-to-peer interactions, or solicited business call to actions that result in transactions. 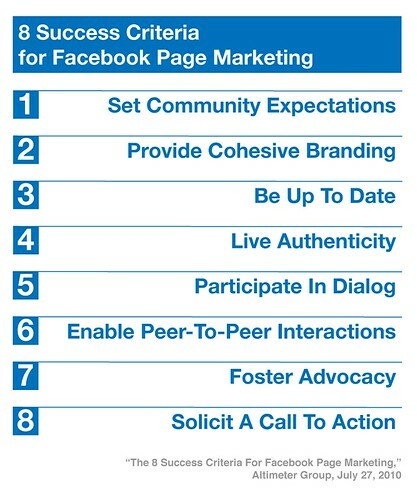 How should brands approach their Facebook page marketing? We asked the experts. Research means digging in deeper to find the truth, and we know our place in the ecosystem is to work with others. As a result, we had a call for submissions, and we received input from 34 vendors, agencies, brands, and individual experts. We read blog posts, looked at examples, and reviewed case studies. 360i, AKQA, Awareness, The Community Roundtable, Context Optional, Digital Evolution Group, Edelman Digital, Facebook, Gigya, Horn Group, Inside Facebook, Janrain, KickApps, Lithium, LiveWorld, Ogilvy’s 360° Digital Influence, Razorfish, RockYou, SHIFT Communications, Spredfast, StepChange Group, a Powered Company, Vitrue and Wildfire Interactive. We also received input from individual contributors such as: David Armano, David Berkowitz, Bert DuMars, Charlene Li, Dave McClure, Annie Noll, Shiv Singh, Adam Smith, Justin Smith, Jason Sullivan, and Anita Wong. Then, we put 30 brands to the test to find out who’s doing it right –and wrong. 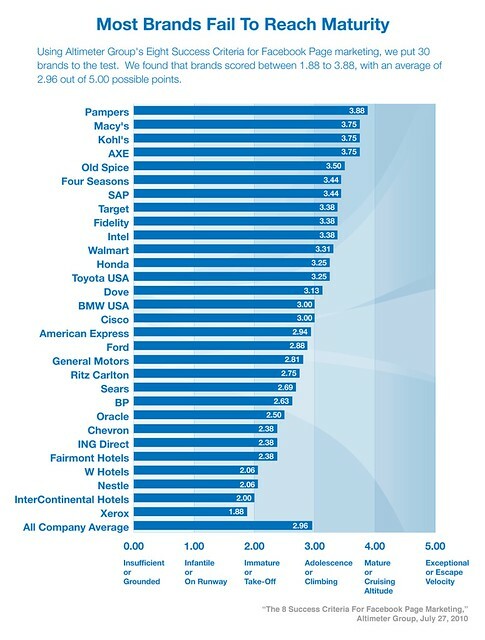 We then took that criteria, created a scorecard with quantitative criteria, and measured the world’s top brands on their Facebook efforts to find out who’s doing it right, and who’s not. In the embedded report, you can download many of the high level findings, as well as see screenshots, comparison by industry and read our recommendations. About the Altimeter research team. For this report, I’m very thankful to work closely with Altimeter Partner, Alan Webber (bio, Twitter), who served as Editor. Alan is a multi-talented guy who stems from Forrester with a strong background in web user experience, and was able to tighten down the scorecard methodology which we’ll use to help clients. Christine Tran, Researcher (blog, Twitter), lead a detailed and thorough research process, always kept the ball rolling and is a consistent and reliable source of quality work, long hours, and positive energy. I’m very thankful for both of their consistent help! We want to be facilitators of the ecosystem and want to work closely with the marketplace. We’re publishing our report under Open Research, at no-cost under creative commons licensing, this report was 100% funded by Altimeter Group, we also do our best to disclose our financial relationships. To make Open Research work, we hope you read it, spread it, and use it to improve. If you found this research report helpful, please embed it on your blog, email it to your teams, and spread it to others. Facebook has posted to their official Facebook PR account. DavaiDavai embeds the report, and enjoys the conclusions. Shiv Singh, a contributor, and now with Pepsi blogs about the report and adds two more. Research contributor, Digital Evolution Group’s Ramsey posts his thoughts. Update: We’ve posted additional data that wasn’t specifically in the report, read more here.